Its 9 dies in 1! 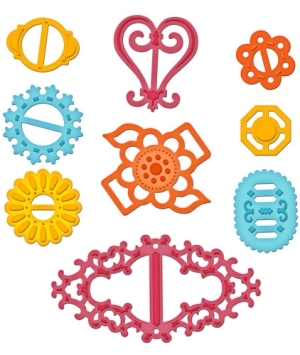 Embellish ribbon on cards and scrapbook pages with this fun array of Ribbon Buckles! They are designed to work with ribbon of widths up to 7/8". Ribbon Buckles shapes are decorative, fun and funky. This versatile set of nine will be used again and again! 16 Petal Flower: 1 1/8"
Scalloped Oval: 1 1/8 x 7/8"
Heart: 1 3/8 x 1 1/8"
Flower and Leaves: 1½ x 1 5/8"
Persian Accents are a floral themed set with roots in ancient times. This six-piece set features symmetrical abstract patterns that cut, emboss and stencil for unlimited options. 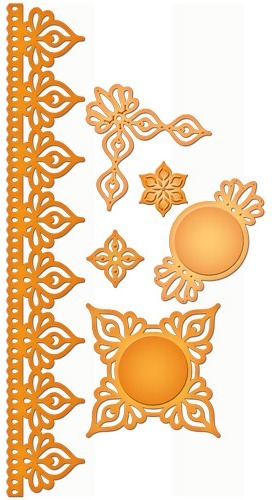 This set includes a 8 ¾ border along with different sized accents. 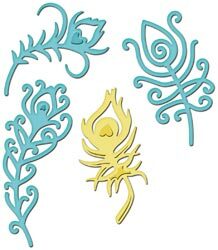 Use them individually, combine with S5-079 Persian Motifs, or stack and layer with other Spellbinders die shapes. 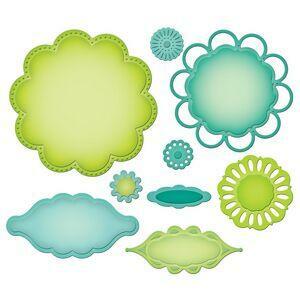 4 Petal Flower: 1 1/8 x 1 1/8"
Oblong Accent: 2 5/8 x 1 3/8"
Large Accent: 3 3/8 x 3 3/8"
Timeless elegance in a die cut shape! 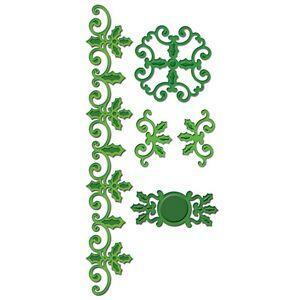 The luxurious damask is now die cuts and embosses beautifully in Spellbinders Shapeabilities® Motifs and Accents! 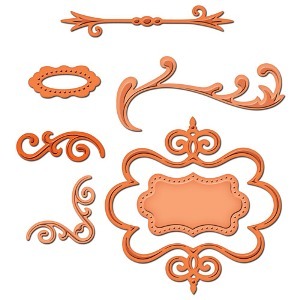 The seven-piece Damask Accents set includes leaves, a tag, border and accents in ornate damask shapes. Layer within the set, mix and match with S5-081 Damask Motifs, and combine with other Spellbinders Labels and more for a uniquely luxurious look that is easy to create! 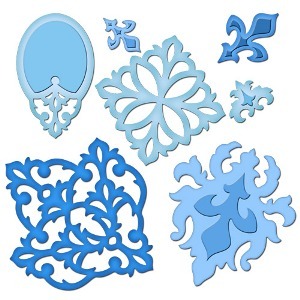 Border: 8 5/8 x 1 1/8"
Tag: 1 5/8 x 2 5/8"
Damask: 1 7/8 x 13 /8"
Oval: 2 1/8 x 3/8"
Fleur de Lis LG: 1 3/8 x 1"
Fleur de Lis SM: 7/8 x 5/8"
Damask SM: 2¼ x 2 5/8"
Damask LG: 2¾ x 3 1/8"
Oblong Accent: 1 5/8 x 3"
This set mixes and stacks with each other and the S5-064 Moroccan Accents. 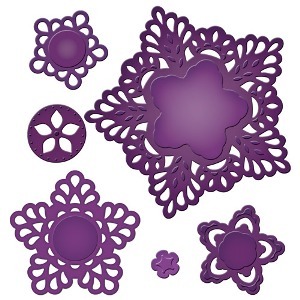 Layer the pieces for elegant dimension, or use individually on cards, scrapbook pages and mixed media art. 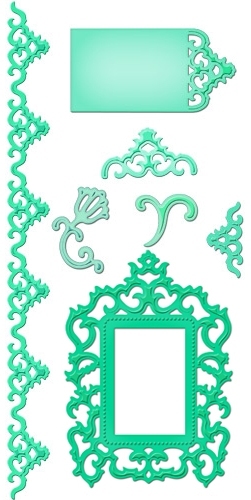 Add old world elegance to paper craft projects. 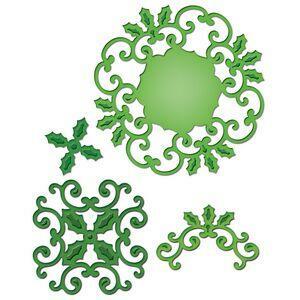 Elaborate cut lines complimented by fine embossing make this ornamental set special. The frame opening is 1½ x 2 1/8", great for a photo or stamped verse. The tag features both ornate detail and space for a written note. 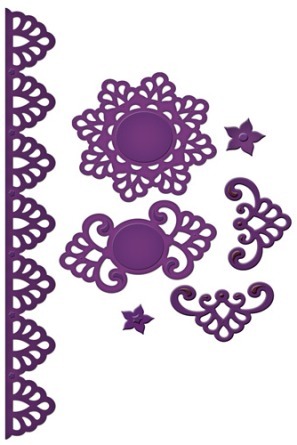 The border extends 9" long, which is great for both cards and scrapbook pages. 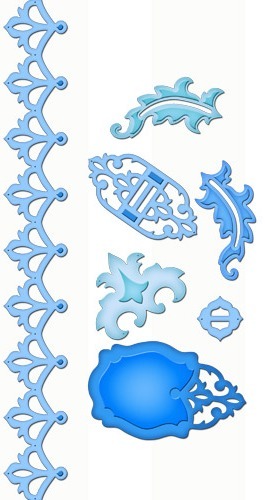 Accents include corner pieces, a scroll, and fancy flower, all coordinated to work with the entire set. Frame: 3 x 4¼" Inside Opening: 1½ x 2 1/8"
Corner SM: 1 3/8 x 0.5/8"
Corner LG: 1¾ x 0.7/8"
Scroll: 1 1/8 x 1 1/8"
This set is sew much fun! The antique sewing machine and fancy dress form are so very trendy. 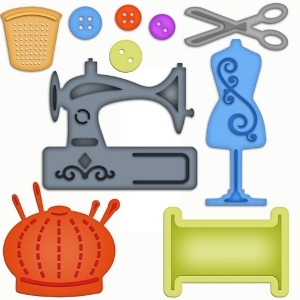 Scissors, buttons, a thimble and pin cushion are perfect accents to stitch into your projects. The spool is large enough to wrap fiber or ribbon around, or even stamp a write a message. Sew many possibilities! Machine: 2½ x 2 1/8"
Pin Cushion: 1 7/8 x 1 7/8"
Dress Form: 1 x 2 7/8"
Scissors: 1 5/8 x ¾"
Inspired by her jewelry making background, Julianna Hudgins created the Jewel Stones to emulate gem stone shapes. 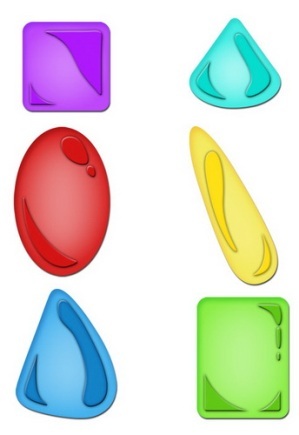 Use the messages and meanings of gem stones to tell your story through projects with die cut and embossed Jewel Stones shapes. Create the look of real stones with mediums such as shrink plastic, mica, metal, glitter sprays and more! Triangle/Trillion SM: 1½" x 13/8"
Triangle/Trillion LG 15/8 x 21/8"
Inspired by her jewelry making background, Julianna Hudgins designed this set around wire-working icons. Originally designed on a jig with wire, Julianna and her mother Bev Morgan bring together the worlds of wire working and paper crafting. 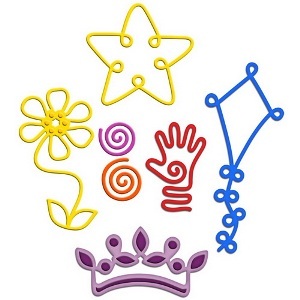 These fun shapes are great for cards, pages and more! 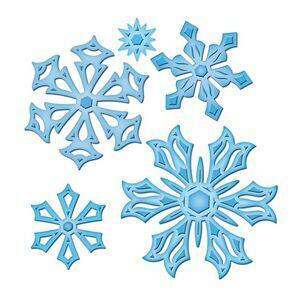 Double the value - use the negative shapes as embellishments too! Coil SM: ¾ x 5/8"
Coil LG: 7/8 x ¾"
Hand: 1 1/8 x 1¾"
Crown: 2 5/8 x 1½"
Kite: 3¾ x 1 5/8"
Flower: 2 7/8 x 1½"
Nina Bracketts simple shabby designs convey the comfort of home. Assemble your home with a heart or star nested inside the frame. Add the roof and wings for a folk art look. Embellish with tag shapes and buttons that coordinate. 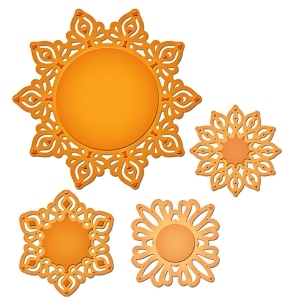 This fun set is perfect for all ranges of projects and styles! 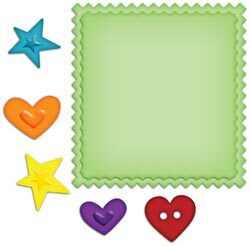 Star LG: 17/8 x 1¾"
Heart LG: 11/8 x 11/8"
Rectangle Tag: 1¼ x 7/8"
Designed by Donna Salazar and inspired by mixed media icons, this set includes fun found items! 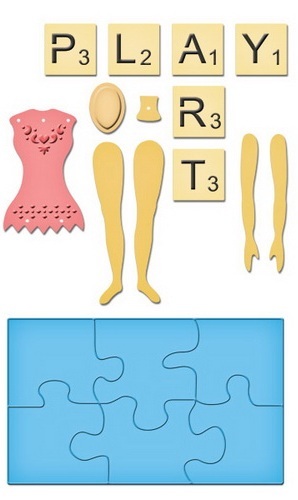 Use puzzle pieces for a message, photo. Spell out Play and Art with letter tiles, the letters emboss! embossing. Create and decorate your own art dolls! Mixed media can be elegant! Designed by Donna Salazar, this set centers around a realistic bird, with separate wings. Cut and emboss the tree branch for the bird to perch on. 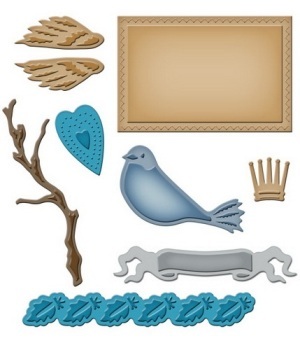 Additional mixed media icons include a stylized crown leaf border. Emboss or pierce the detail into heart shape, and layer the elements onto the rectangle card, it features a zig-zag border. An ornately appointed tag creates the focal point for this Samantha Walker Designer Collection die template set. 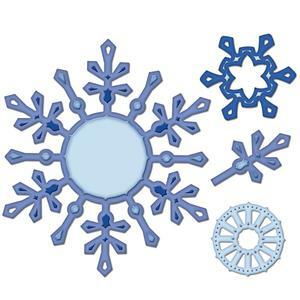 Two smaller nesting tags feature intricate embossed detail and curvy shapes. Flourish inspired accents include a corner piece and borders in various lengths, each uniquely designed to coordinate with the tags while resembling wrought iron. 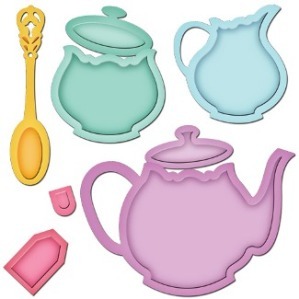 This eight-piece tea service includes a tea pot and lid, creamer, sugar with lid, spoon, tea bag and tag. 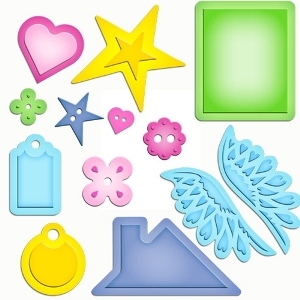 Can be combined with virtually any other Spellbinders die template set for custom designs! 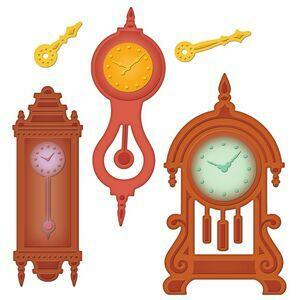 The main pieces are large enough to use for stamped verses or images. Cut and emboss with patterned paper to create the look of grandmothers finest china, or use or Premium Craft Foil to replicate the look of classic silver. Tea Pot: 35/8 x 2¼"
Tea Bag: 1 x 5/8"
Tea Bag Tag: 3/8 x ½"
Pendulum Pieces: SM: 1¼ x ½ MED: 1½ x 3/8 inch LG: 2 x 5/8 inch Faces: SM: 1 inch LG: 1¼ inch.